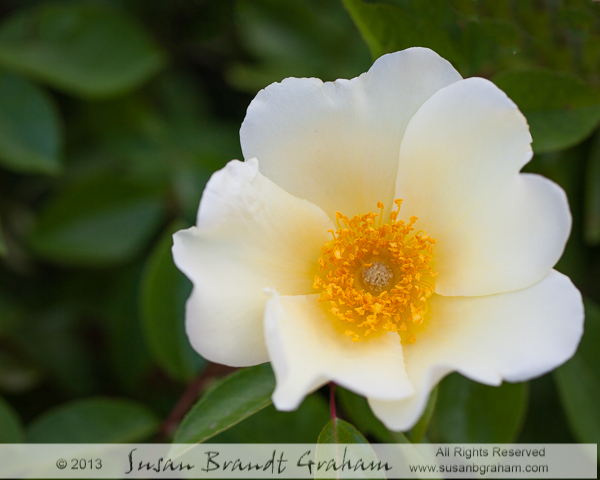 Mermaid is a beautiful old garden rose (Hybrid bracteata 1918) that long time readers here know well. 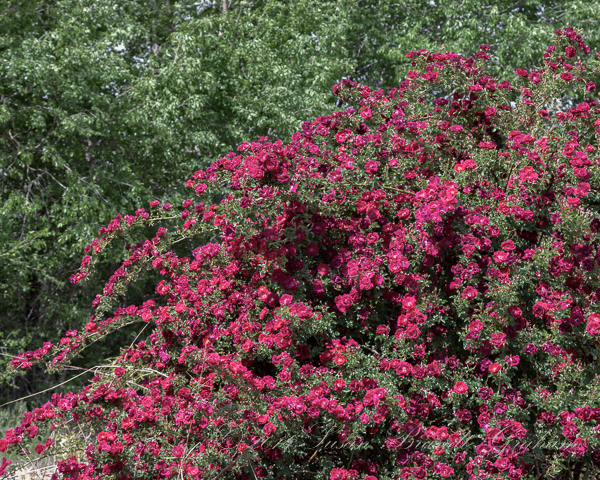 In May of 2006 it was reaching its peak after having been planted several years before. 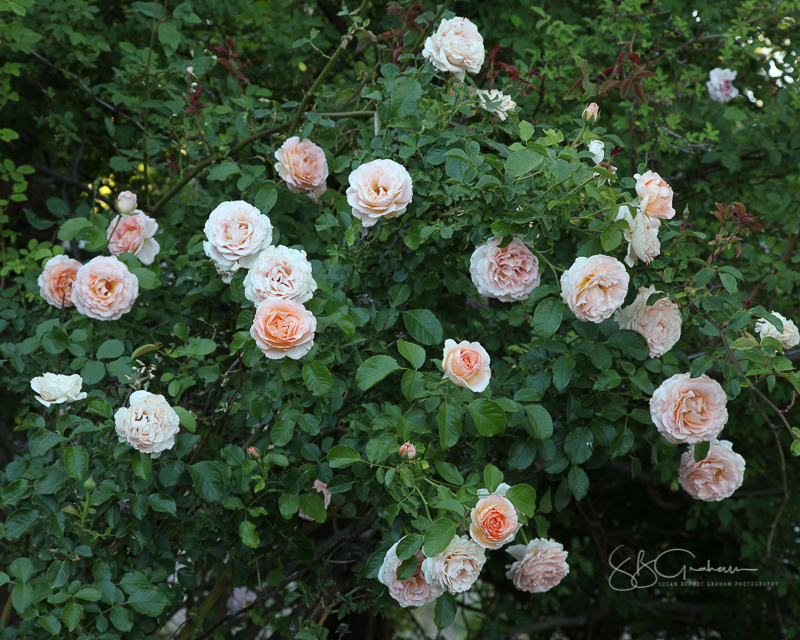 It took Best of Show at the Spring 2006 Albuquerque Rose Show, along with the ARS Victorian Award for Old Garden Roses with unknown date of introduction or introduced in or after 1867. Who could have imagined what December of 2006 would bring? Mid December of 2006 brought an 8 inch snowfall to my house. It was heavy and wet, and pulled Mermaid and its trellis a little away from the wall. But I was sick at the time, thought there wouldn’t be more snow at least for a while, and I could repair things when I felt better. Big mistake! A week later or so I got an unheard-of-for-here 22 inch snowfall at my house! The melting and refreezing, melting and refreezing added more weight, and in the middle of one night with a noise loud enough to awaken me at the other end of the house, Mermaid and trellis came crashing down across the patio. It took me weeks to get that mess cleaned up to the point I could walk out into the rest of the yard. To do it, I had to cut everything, including the clematis that had been growing with Mermaid, off at ground level. I thought everything was gone. Imagine my joy at finding tiny basal breaks later in the spring of 2007! Mermaid did not grow a lot in 2007, but the companion clematis came back more rapidly. 2008 was even better. By 2009, things were looking very good. 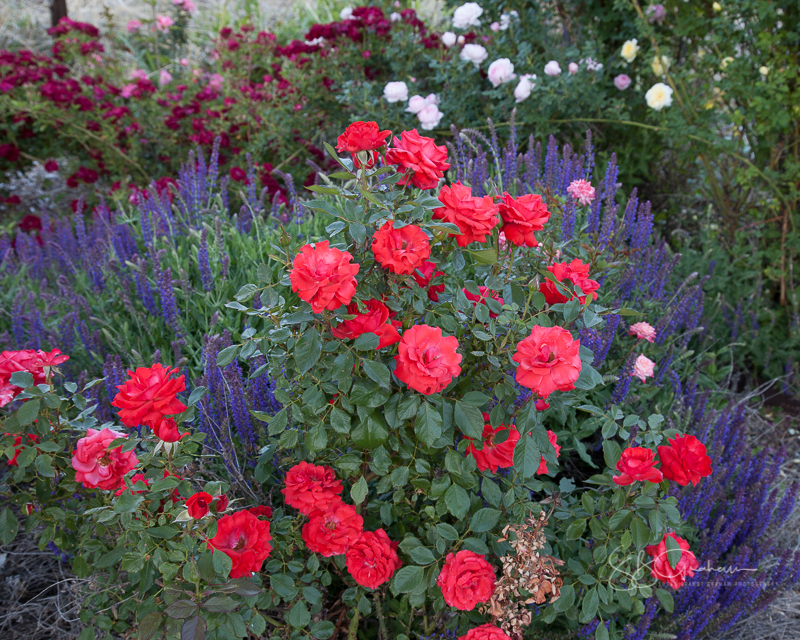 At the Spring 2010 Albuquerque Rose Show, Mermaid once again won the ARS Victorian Award along with Best of Show. The 2014-2015 winter in Albuquerque was quite mild. Mermaid’s spring bloom this year was probably the best I have seen since the 2006 damage. 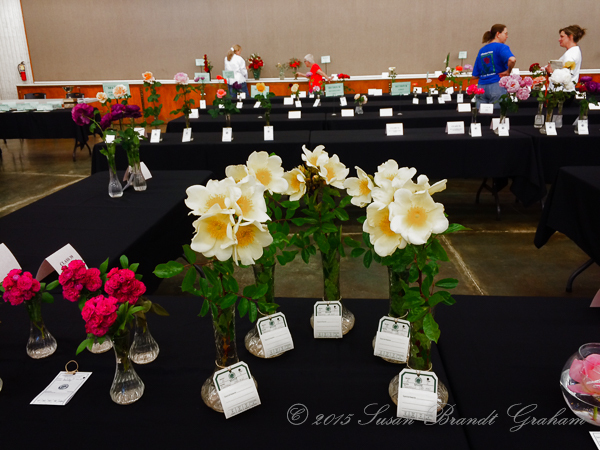 Once again, at the Spring 2015 Albuquerque Rose Show, Mermaid took Best of Show (5 matched sprays in the entry in “Exhibitor’s Dream”) along with the ARS Victorian Award. 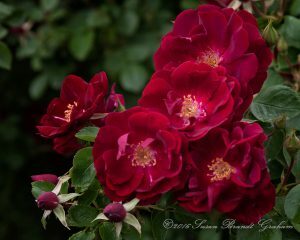 This is a rose you will not see often in rose shows, because it is an “eight-hour wonder!” It opens in the morning, and drops its petals by evening. But, it is gorgeous during that time! 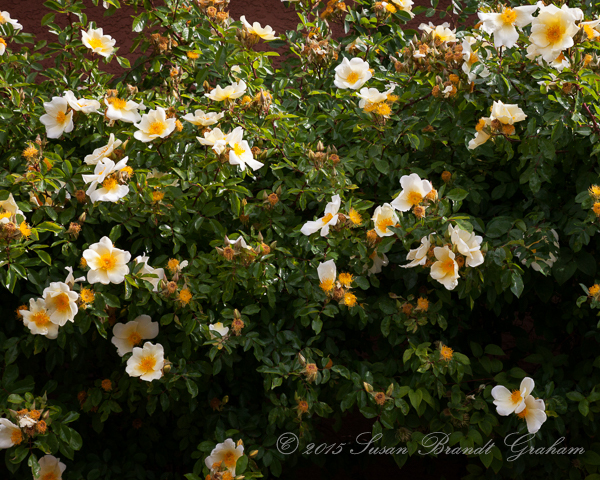 Mermaid – one of my favorite roses, and back to being a focal point in the garden of my small Albuquerque yard. 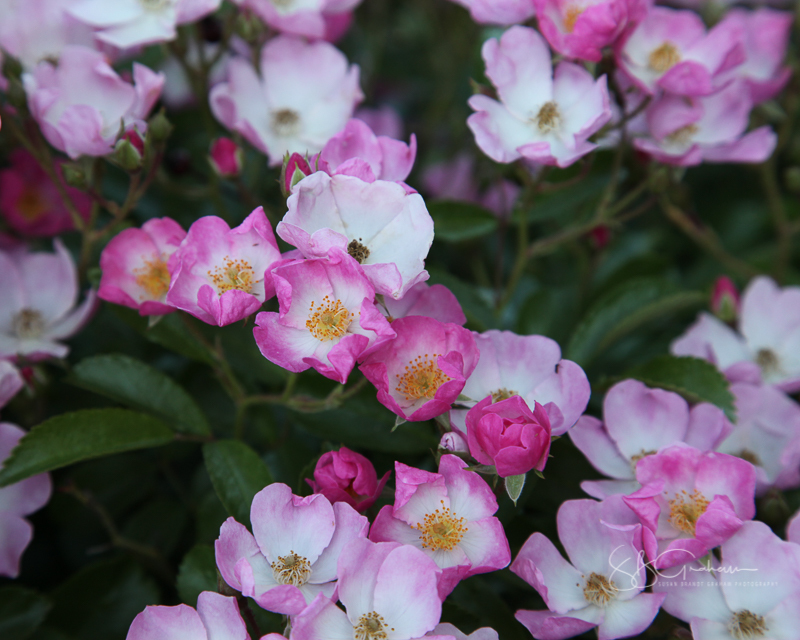 Dr Huey, a hybrid wichurana, is a rose known in some form to most rose growers. 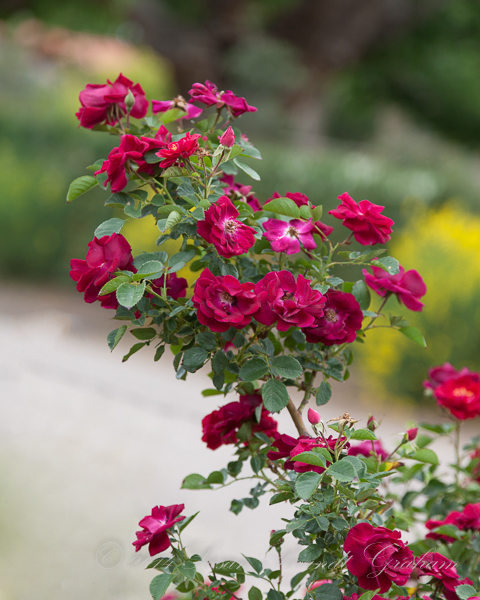 A very few people grow it as the rose itself, but that is the exception rather than the rule. It is a mildew magnet, at least in my yard, and a once bloomer. During the spring bloom, however, it can be spectacular. 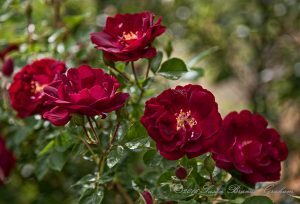 For many years Dr Huey has been used a root-stock onto which to graft roses known for their blooms. It has been very useful for that purpose. 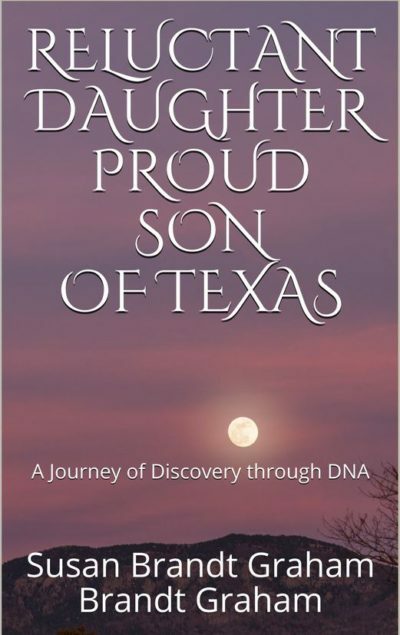 Many of us encounter Dr Huey when we have “shovel pruned” a rose and not completely gotten out the roots of this root-stock. 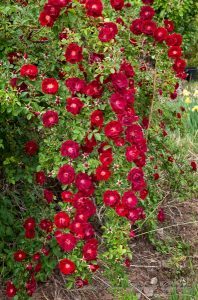 We may also encounter it after various adverse conditions – drought, cold, and so forth – have stressed the grafted rose, and only the strong root-stock remains. That is one way of saying I have it in my yard every now and then. 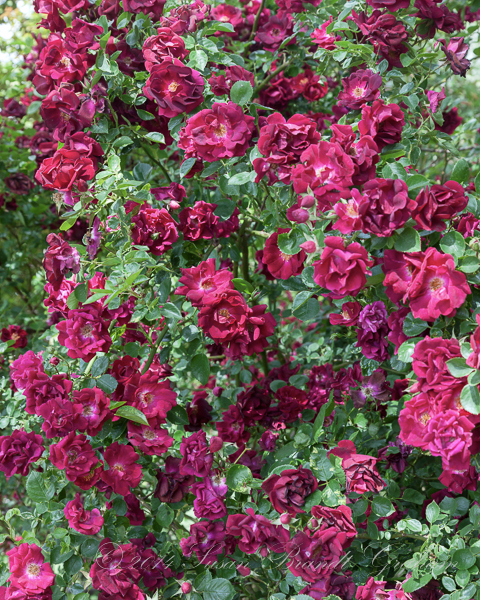 If it appears in the spring, I usually leave it until after the local rose show in case I want to use the foliage as line material in arrangements. 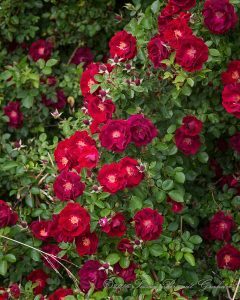 Then, I will work to remove it so the planned rose in that spot can grow without competition from the strong root-stock. Here in the high desert in the Rio Grande Valley, we have a variety of growing conditions that challenge the most dedicated gardeners. 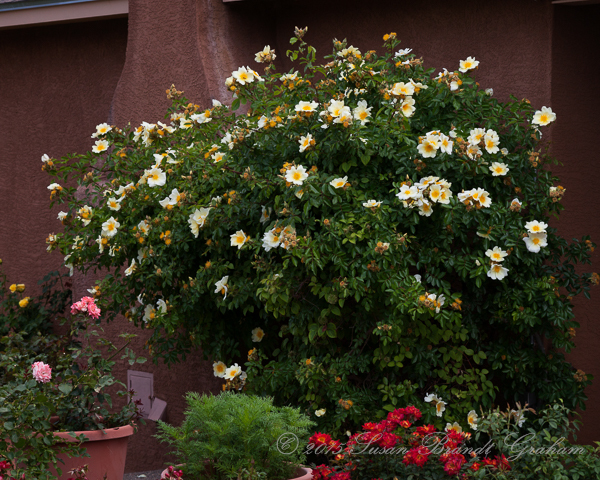 Once the soil has been amended, roses do pretty well where I live in Albuquerque if they get adequate water. 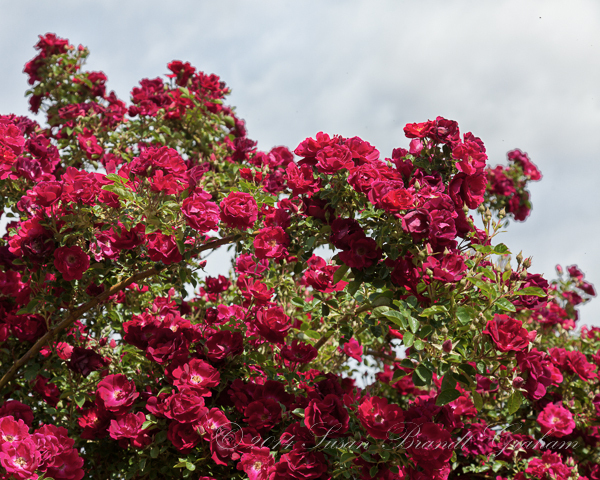 In February 2011 we had an extreme cold snap from which I did lose some roses, but that is rare. 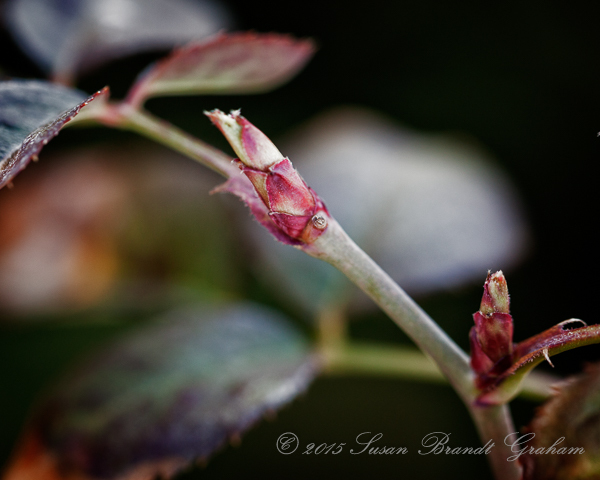 We do not winterize our roses here, because it generally is not necessary. I live up toward the mountains and away from the river. 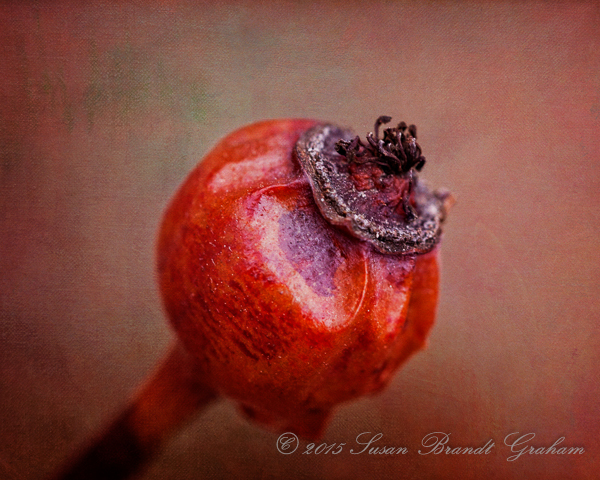 My friends are not the only ones who are “hard on roses” in the Rio Grande Valley. 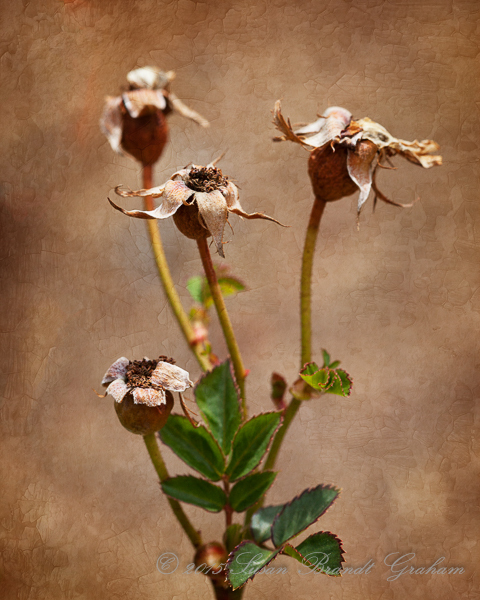 The entire community in which they live is “hard on roses,” if, that is, they are grafted roses. 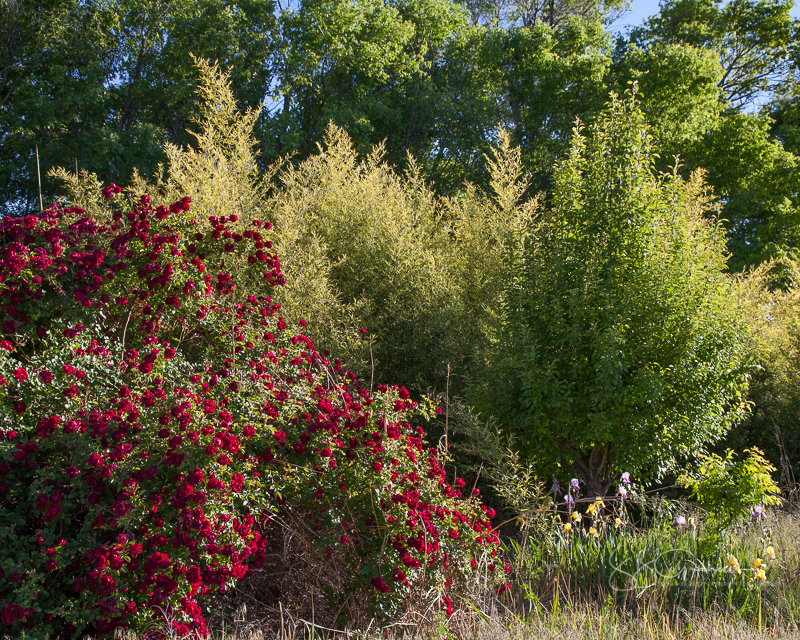 For a week or two in the spring, Dr Huey can be seen in bloom everywhere, and it is quite beautiful. 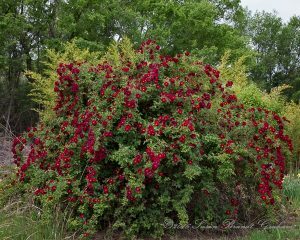 This rose can get huge, and covered with blooms can be very spectacular. 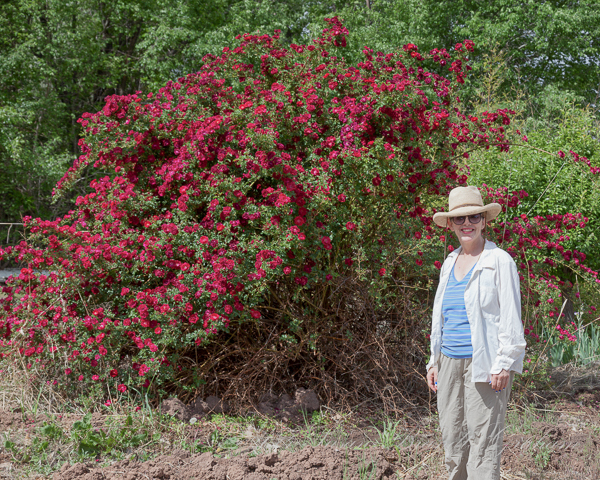 These images of Dr Huey are from the First Annual Dr Huey Rose Tour of the Corrales Rose Society, last year (2014). Dr Huey at entrance to vineyard in the Rio Grande Valley. It was a stormy day. HUGE Dr Huey. Follow it out to the sides of the image! 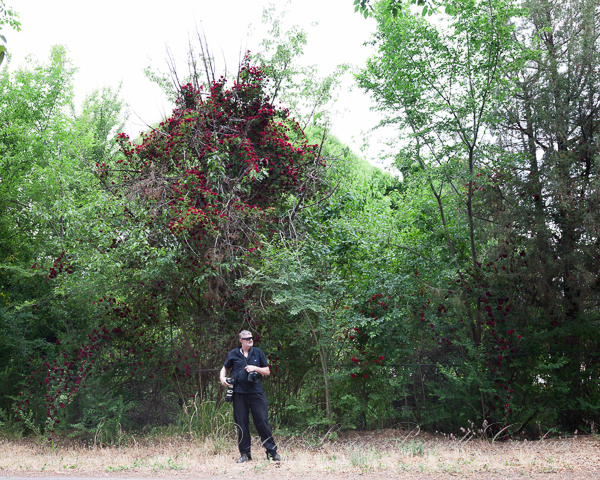 When to prune roses is a constant dilemma in the High Desert. 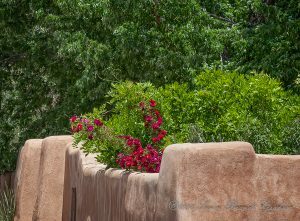 Although this blog is titled “Southwest Desert Gardening,” there are so many different environments in the large sense and microclimates in the small sense, that no universal recommendations are possible. 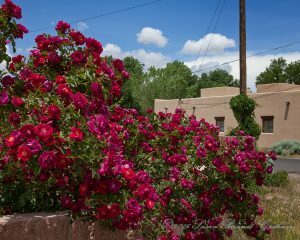 Roses are already reported to be blooming in Tucson, Arizona, and the good folks in Santa Fe will prune their roses even later than we do here in Albuquerque. 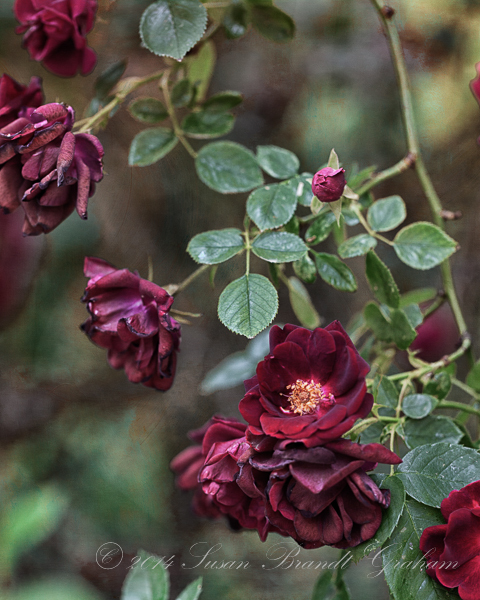 My mom lives less than a mile from me as the crow flies, and she has already pruned her roses; her yard runs 5°-10°F warmer than mine. Within my very small yard are several microclimates. It is very warm against a south-facing wall, and quite cool against a north-facing wall; that is always the last place the snow melts in my yard. The “Average Last Frost-Free Date” has generally – in the past – been agreed to be April 15. That has to be seen as truly an average for a large area, and it may not apply to many spots in that large area. 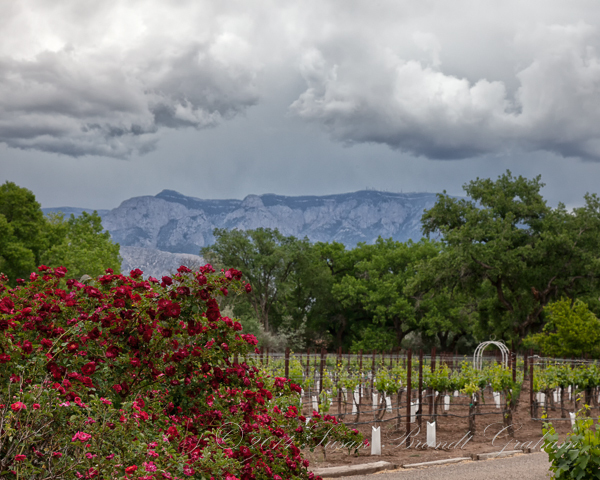 It probably does apply to where I live, but I have friends in Corrales who regularly get freezes well into May, and sometimes even later. 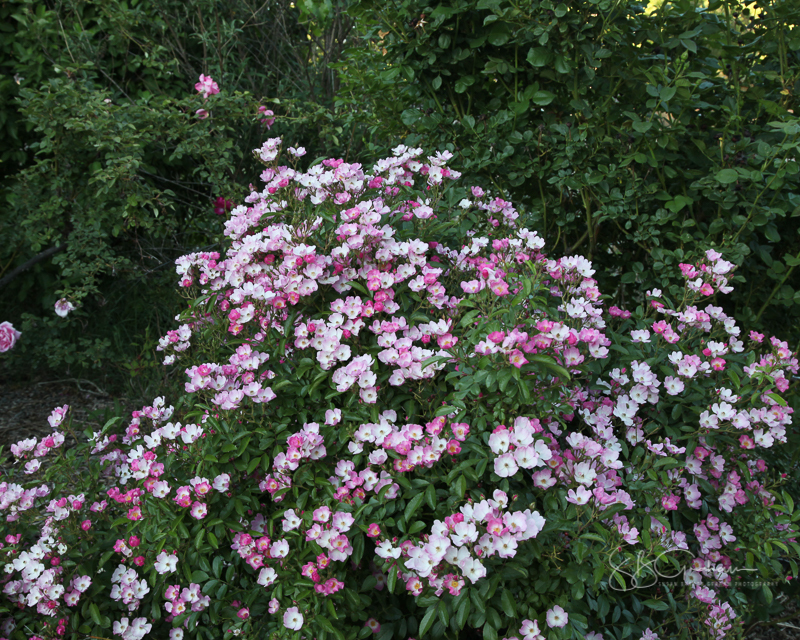 I generally prune around the beginning of April, and do not fertilize until well past mid-April. There have been years when I lost a lot of new growth in May from a late freeze. 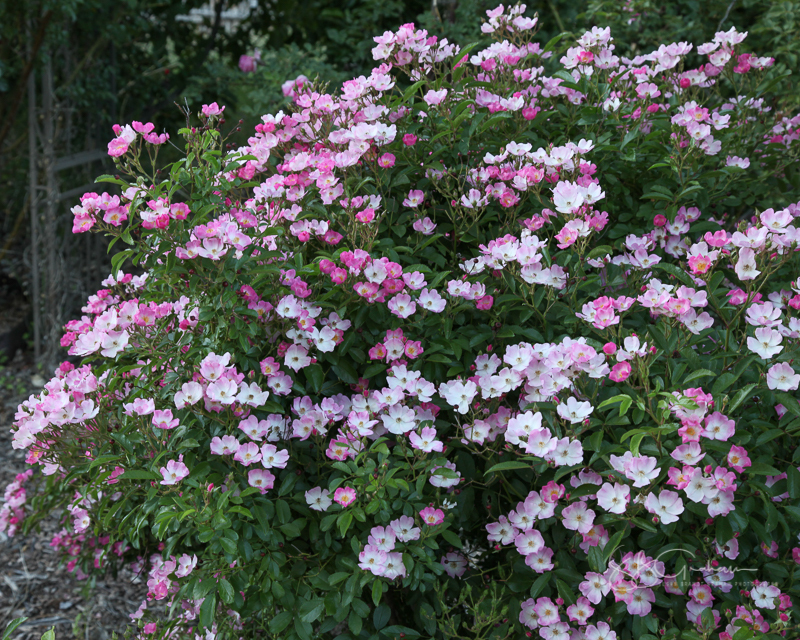 The images for today’s post are from the modern shrub rose, ‘Route 66.’ The flowers are purple with a white eye, and have a strong, very pleasant scent. It is one of the first in my yard to bloom in the spring. 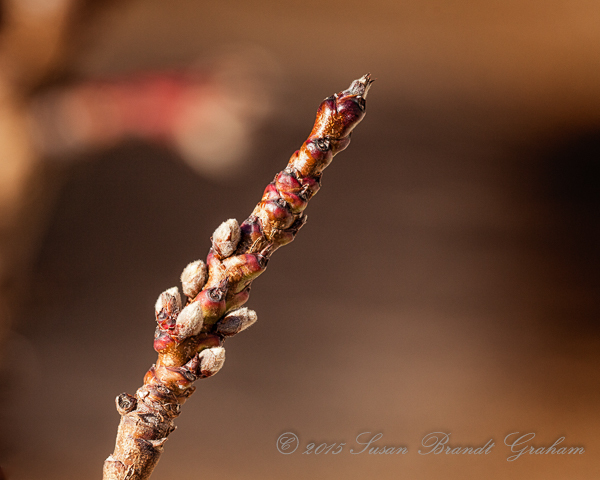 As I was looking things over, I spotted a bud from last year that froze in the fall before it ever completely opened. 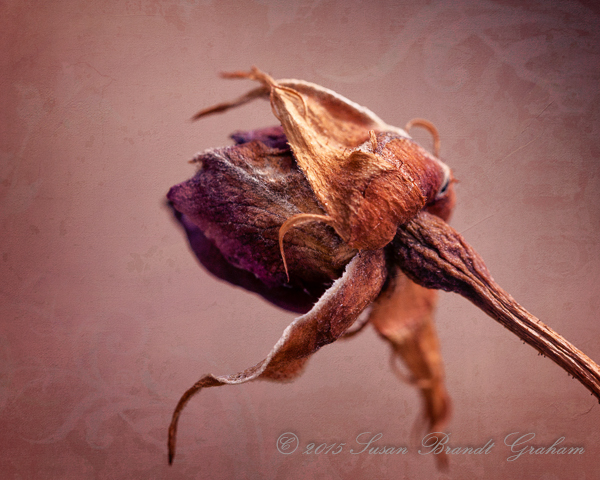 You can tell, even as dried as it is, that the flower would have been purple. Because it did not bloom, a true hip did not form. 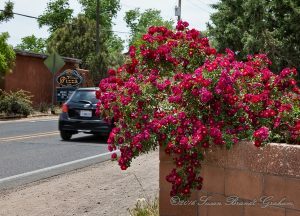 I also found a “spray” of hips on ‘Route 66.’ When I do prune roses, this will be one of the first. Ice after Snow – Not So Good for the Garden! Ice this afternoon followed the snow this morning. I was happy to wake up to five inches of snow. We have needed precipitation for so long, that even I was delighted to see snow. 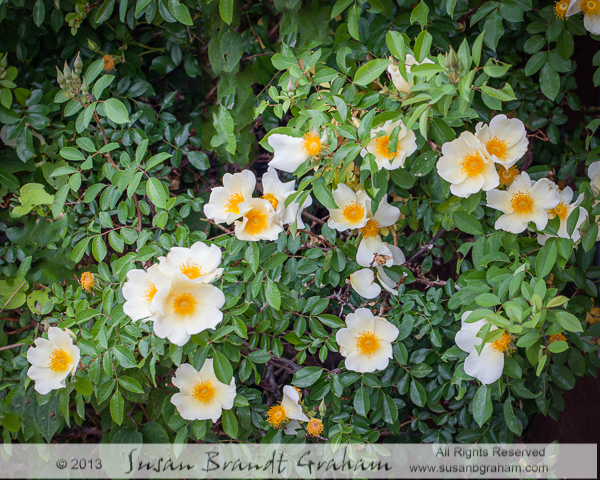 Some images from this morning can be seen at my photography blog. Although the temperature did not warm to above freezing at my house today, some of the snow on the roof began to melt, and icicles formed at the edge. 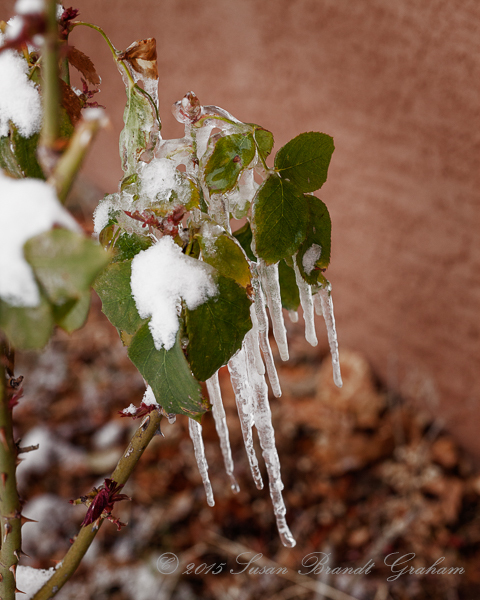 They began to drip droplets onto some of my roses, where that water immediately formed ice. This is not something you want to see happening. Some of you who have followed this blog from its beginning may recall the damage done to my old garden rose, ‘Mermaid,’ when a 22 inch snow began to melt, refreeze, melt, refreeze, until ‘Mermaid,’ was pulled off the wall and laid out across my patio by the weight of the ice. It is why I now do something that most people would say I should not do – I prune ‘Mermaid’ back in late fall. It has proven to be a good strategy for this particular rose in this one particular spot. (Some images of ‘Mermaid’ and the damage may be seen at the following links. Those images were taken with an old Nikon Coolpix, the first digital camera I owned. Thus, the odd settings that those of you who know your way around cameras will note. Here in the high desert, Albuquerque, we do not prune until late March and preferably early April. That is because of the threat of late freezes. When I do prune this year, I will have damage from today to remove. At the time of this writing, it appears that ‘St. Patrick’ will have the most damage. You see two different ice formations on ‘St. Patrick.’ The icicles are clear, and are not that big of a threat at that size. But, you can also see in this image a branch that was bent by the weight of the ice, and then droplets continued to drip from the icicles on the roof, weighing down the branch even more. Here’s a hint – you cannot shake ice off a branch like that, in the way you can shake snow off. That branch is broken by the weight of the ice. Those of you who are rosarians will understand that I had really wanted ‘St. Patrick’ to have a really good year in 2015. It may yet; it is far too early to tell for sure. 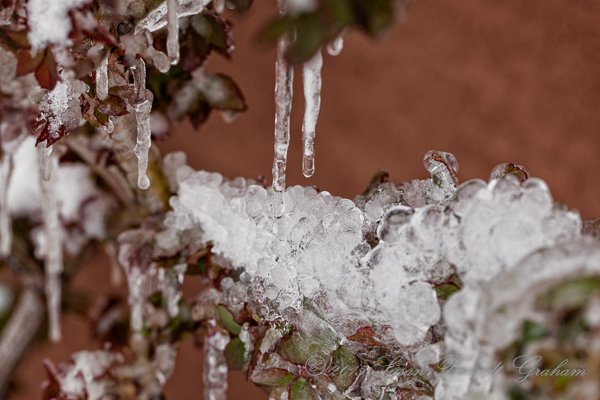 But this ice is potentially a major setback for this rose bush. The icicles at this size are not a major problem for ‘Veterans’ Honor.’ However, this image shows why we do not prune until later. The leaves you see are last year’s leaves. But, if you look closely, you see new growth (red) appearing along the cane. 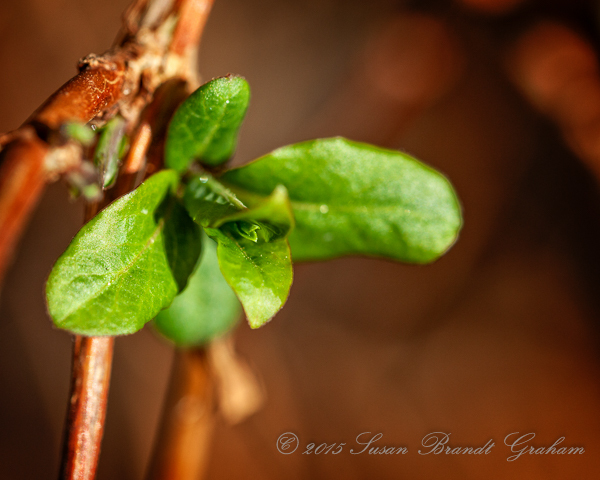 This new growth will not survive the freezing temperatures. 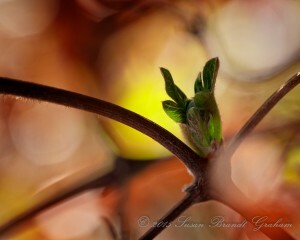 That is okay; there are still a lot of places for new growth when spring does arrive. Many places for new growth would have been removed had this hybrid tea been pruned. I’m not a bit worried about this rose, at least as of today. Who knows what weather lies ahead? But, for today, it is okay. 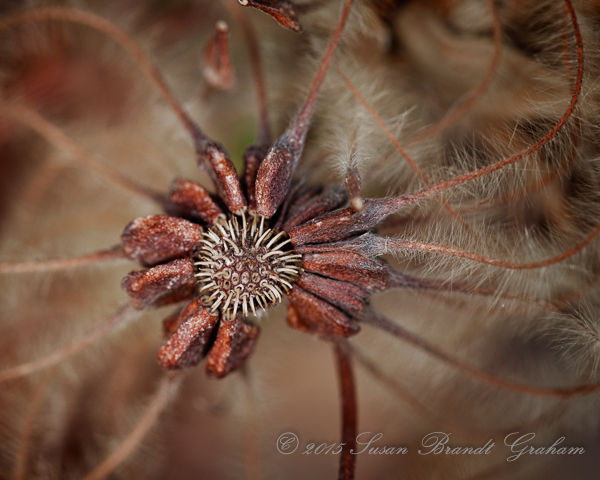 Winter beauty in the garden is often overlooked. While things can appear brown and dry in the winter, especially in the high desert of the Southwest, bits of color can be found as well. 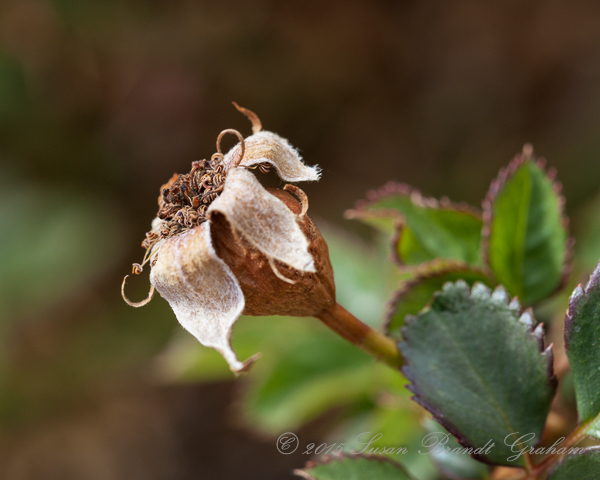 Here in Albuquerque, we have had some unusually warm days for an extended period of time, and roses in particular are beginning to show leaf buds way too early this year. If it stays warm, that will not be a problem. 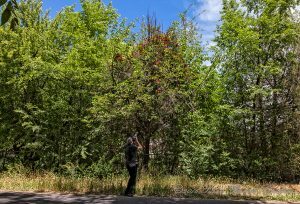 If we get the almost-invariable cold snap at this point in time, the plants could be damaged and blooms delayed. Hopefully, that will not happen! 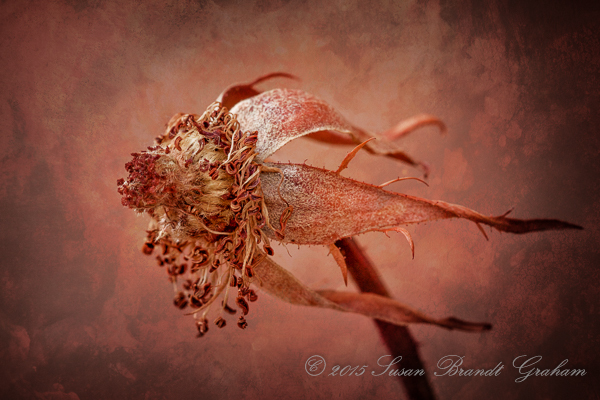 As I was out surveying just how many plants in my yard are way ahead of schedule this year, I photographed some remains of last year’s blooms. I personally find them quite beautiful, and I hope you enjoy seeing them. February gardening in New Mexico? Well, that can be both a temptation and a challenge. 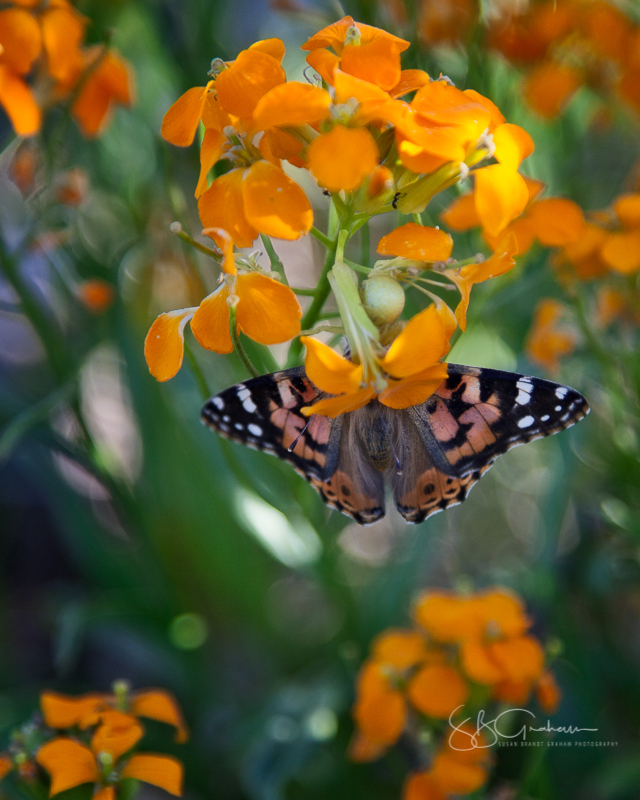 Here in Albuquerque we are in the midst of a series of warm, sunny days without wind; perfect gardening weather! The problem is, our average latest frost-free date is in mid-April, and I have seen killing freezes as late as May. 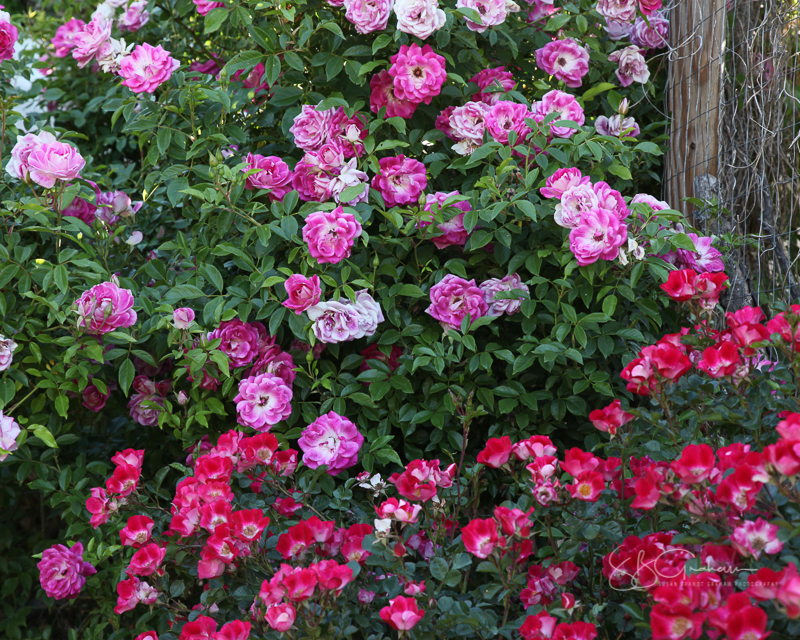 When it comes to roses, for example, we tend not to prune until early April, and fertilize even later. Fortunately, there is no shortage of things to do in the garden in February when the days are so wonderful for being out. I did some weeding; I need to do a lot more before Spring really does arrive! I removed some dead canes from some of the roses. 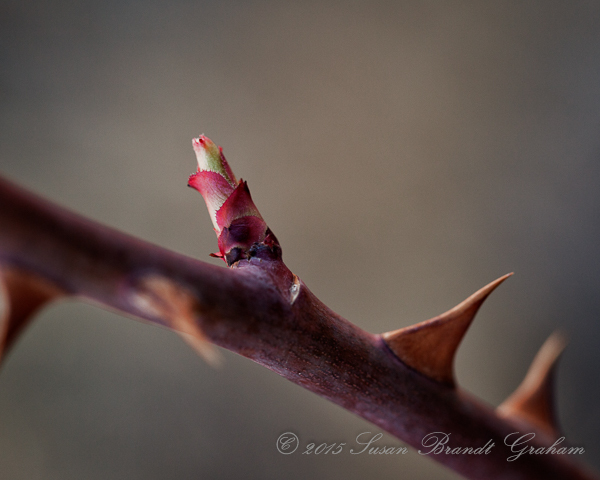 This is not pruning; this is removing dead canes, plain and simple. 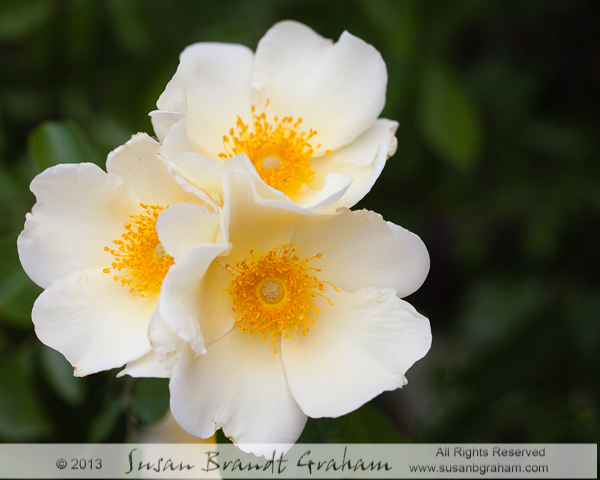 I couldn’t help looking over my own-root miniature roses in containers, in protected areas. Some of these have not been appropriately pruned in some time. They always start to leaf out in February, and by the time another 6-8 weeks go by, they are virtually impossible to prune. The canes become spindly, and the blossoms smaller and with less perfect form. the majority could look like they always have. I want to stress that I did this only with own-root roses in protected areas, for this February gardening and rose pruning action. 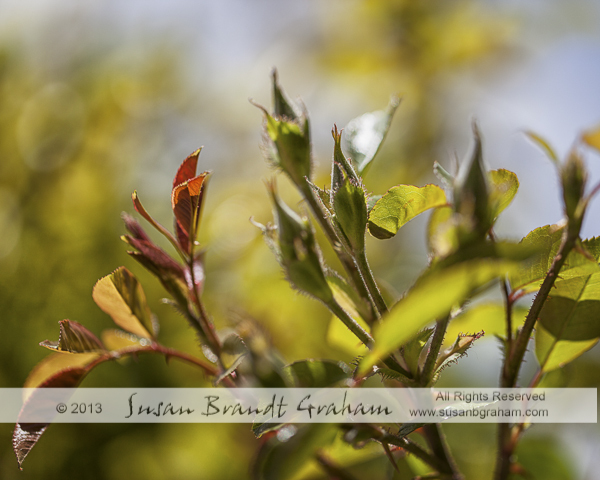 This is not the only time I have gone against conventional wisdom in the pruning of some of my roses. 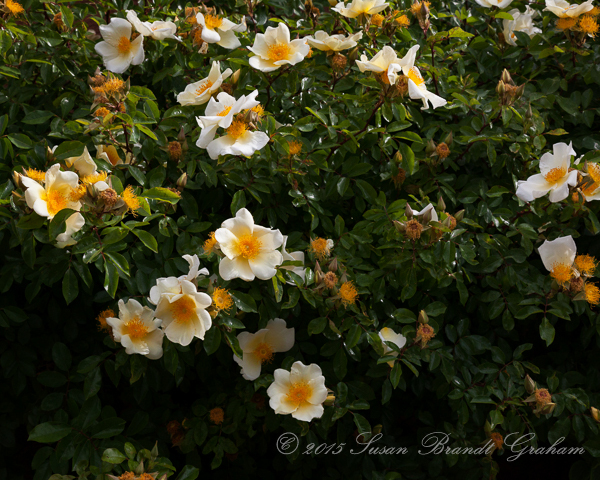 Some of you know that I have the Old Garden Rose, ‘Mermaid,’ a Hybrid bracteata introduced in 1918. After its near-demise in the 22 inch snow (“The Big Snow of 2006”), I always cut it back in the fall, and then do not trim it again until after first bloom. 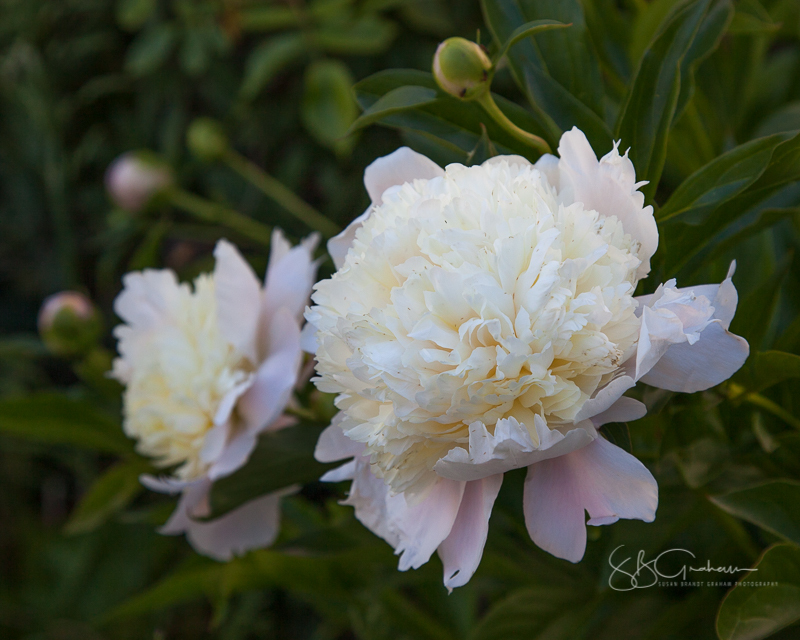 It has rewarded me with lush spring growth and spectacular first blooms. 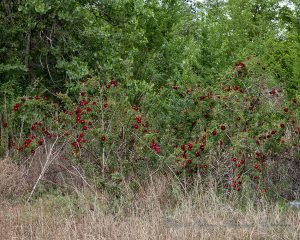 It then blooms intermittently throughout summer and fall. 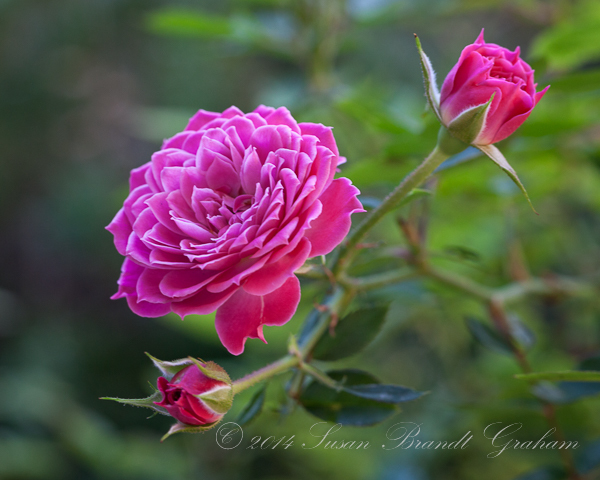 But, this is the first time I have pruned any roses as part of February gardening in Albuquerque. I’ll keep you updated on the result. Miniature rose ‘Marriotta.’ On its own root, and grown by me in a container in a protected spot. Image from Fall, 2014. 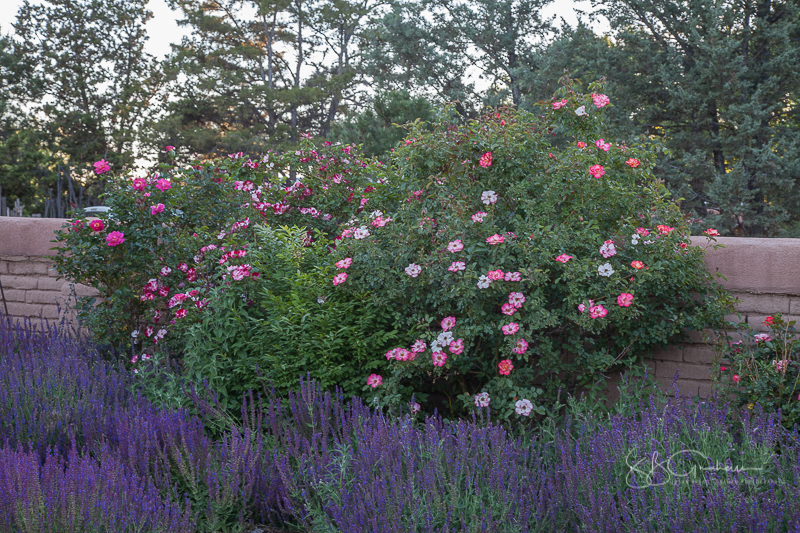 The Old Garden Rose, ‘Mermaid,’ has long been one of my favorites. Regular readers here are aware of my love for this hybrid bracteata, introduced in 1918, which was also the year of my father’s birth. I planted the rose in his memory after he died. 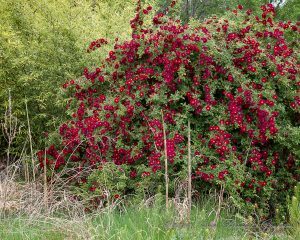 Although known for being somewhat tender, the rose grew huge, climbing up the fireplace within a couple of years. After the 22 inch snow that fell in late December 2006, with thawing, freezing, thawing, freezing, etc., the weight of the ice tore ‘Mermaid’ and its trellis off the wall of the house, and it had to be cut off at ground level. I was sure it would not recover. Recovery was very slow, but ‘Mermaid’ did recover to virtually her old self by the spring of 2010.